This recipe was inspired by a pound of “Italian Pizza Sausage” made by a local farmer. I had no idea what I was going to do with it, but I was so excited to see locally and humanely raised pork that I couldn’t pass it up. We have been addicted ever since. We affectionately named this meal “Pizza Rice” after my non-allergic kids favorite carry out meal: sausage pizza. Obviously, pizza is not allergy-friendly, so this is a great way to enjoy the flavor of sausage pizza without the allergens and additives. Because I try to keep rice cooked in chicken stock in the freezer at all times, this meal comes together very quickly. I cook a stock pot full of rice, let it cool, divide and toss in the freezer. This way I am always ready for a quick stir-fry or Mexican dish. 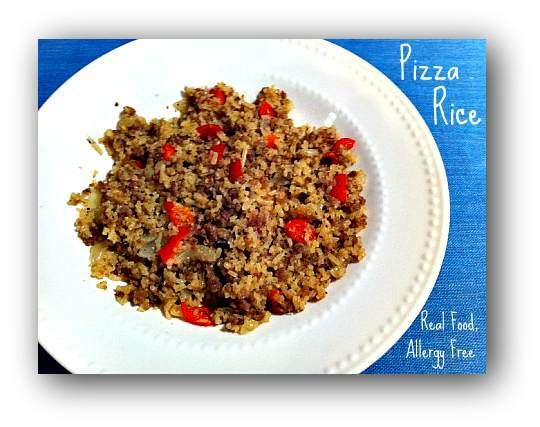 “Pizza Rice” has been a great dish to take to our church pot luck dinners. It’s something everyone can enjoy as a side dish, and if there is nothing safe for Bella to eat, this will be satisfying and filling in itself. Cook onion, pepper and sausage in a large skillet until meat is done and onions are translucent. Stir in rice and cook until heated through. Enjoy! You may also enjoy Italian Sausage and Summer Squash Skillet and Beefy Zucchini Skillet. This post is part of Real Food 101, Real Food Wednesdays, Gluten-Free Wednesdays, Ultimate Recipe Swap, Full Plate Thursday, Pennywise Platter Thursday and Allergy-Friendly Friday.